St. Silverius was pope for a very short time in 546-7 A.D. But his brief pontificate made him a martyr for the truth, which he defended at the cost of his life. He died in exile at the isle of Ponza, for refusing the empress Theodora's demand to reinstate the heresiarch Anthimos in the see of Constantinople. His body was brought back to Rome and laid in the Vatican basilica. According to the 1962 Missal of St. John XXIII the Extraordinary Form of the Roman Rite, today is his feast. When news of Agapitus' death reached Rome, King Theodahad, fearing the imminent Eastern invasion, was determined to have a pro-Gothic ally on the throne of Peter. Silverius, son of the glorified Pope Hormisdas, was his candidate. The clergy reluctantly submitted to the will of their king and elected the subdeacon, accepting him only for the sake of unity. The destiny of this pope, however, would not follow the same glorious path as that of his father. While Silverius was being consecrated in Rome, the emperor's wife Theodora was making her own plans to reinstate the Monophysite, Anthimus, as patriarch of Constantinople. Striking a bargain with the chosen successor of Boniface II, Vigilius (who had been serving as nuncio to Constantinople), the empress packed him off to Rome, promising him the papacy in exchange for the heretic's rehabilitation. But by the time Vigilius reached his destination, Silverius was already tending to the needs of the Apostolic See. The emperor's general Belisarius now marched on Rome. As the Eastern army drew near, the Romans looked to their pope for advice. Silverius, realizing that resistance would be fruitless, recommended surrender. In early December of 536, as a triumphant army occupied Rome, Belisarius summoned the pope to his quarters. Theodora had been adamant with the general—the pope must submit to her wishes or face dire consequences. The general's first tactic with Silverius failed. Using forged letters, Belisarius had accused the pope of treason on the grounds that he had allowed the city's gates to be opened for the retaliating Goths, now led by King Witiges. The general ordered Silverius to concede to the empress by reinstating Anthimus as patriarch and giving in to the Monophysite doctrine. Silverius adamantly refused. Belisarius took no chances the second time; he seized the pope and, stripping him of his pallium, deposed the protesting Silverius, now clothed only in a monk's habit. 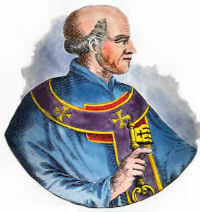 The clergy was then notified by a subdeacon of the pope's terrible treatment and sentence of banishment. When the general ordered the election of a new pope, the ambitious Vigilius was well prepared. Through coercion Belisarius and Vigilius successfully accomplished the nomination and election of the latter by the clergy. Silverius had been deported to Patara, a seaport in Lycia. The local bishop was so distressed that he personally went to Constantinople to plead with Justinian, telling him that Silverius had been unjustly accused and, more, unjustly exiled. The emperor believed there might be some merit to this and ordered Silverius back to Rome to face a fair trial. Moreover, he ordered that, if found innocent, Silverius was to be given back his throne. Vigilius panicked, and as soon as Silverius reached Rome, the new pope ordered his removal to Palmaria, an island in the Gulf of Gaeta. It was on this island that Silverius was forced to submit his abdication. After suffering torture and starvation, Silverius died, a martyr for his Church. Silverius was buried on the same island of his exile, his grave becoming the center of miraculous healings.